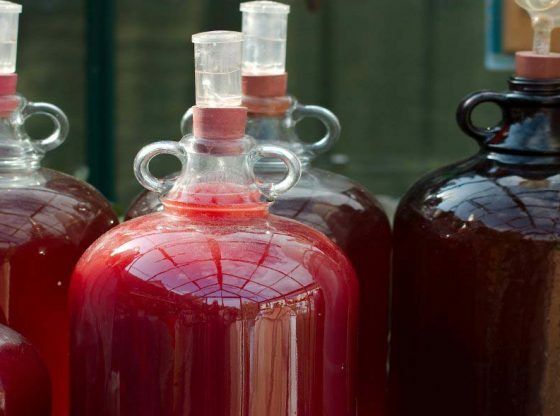 Homemade non-grape wines are easy and quick to create. Not only can you fill your own glass, but those of your friends and family as they make great gifts. I love to use wild-harvested berries and surplus from the homestead garden and orchard to craft unique wines to share with family and friends. However, I warn you, making homemade country wine is addictive: it’s so much fun and you’re only limited by your imagination. Fruit, flower, herb, or vegetable-based wines are often referred to as country wines or non-grape wines. 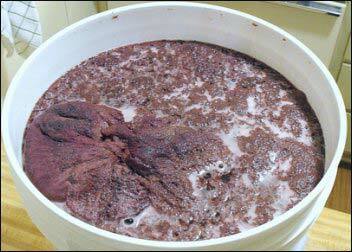 The primary difference between grape-based wines and non-grapes wines is yeast. Grapes naturally contain everything required to ferment: juices, pectin, sugars, and the important fermentation-activating ingredient, yeast. Yeast converts the sugar content of the grapes to carbon dioxide and alcohol as the wine ferments. It is easy to craft a basic grape wine by simply crushing ripe grapes, allowing the mash to ferment in a warm place, and then straining off the liquid. Vegetable, fruit, floral, and herb wines, on the other hand, require yeast be added to the mixture to enhance the fermentation process. Non-grape wine has been produced for centuries in a diverse array of cultures. Wine was considered integral to highly-valued social and personal ceremonies such as marriage feasts, child christenings, and funerals. Dandelion and elderberry are two of the most well-known kinds of country or non-grape wines. The common elderberry has long been prized as food, drink flavoring, and for its amazing medicinal benefits. Since the beginning of the 17th century, the British have embraced elderberry wine. The flavorful berry, commonly called the “Englishman’s grape”, was believed to ward off colds, fever, and influenza while prolonging life. The unique flavor of the tangy elderberry produces a delicious semi-sweet wine. In America, country wines originated with Native American tribes who have a long history of using elderberries, blackberries, choke cherries, huckleberries, blueberries, and raspberries for the fruit wine’s impressive health benefits, delightful flavor, and alcohol-induced state of relaxation. When it comes to dandelion wine, most any country family has a treasured recipe for dandelion wine that has been passed down for generations. The first records of dandelion wine are of Celtic origin. For centuries, dandelion wine was considered one of the finest country wines of Europe. In fact, in the late 1800s, it was scandalous for women to consume anything alcoholic; however, dandelion wine was the exception to the rule. Dandelion wine, treasured for its therapeutic effect on the digestive system, kidneys, and liver was deemed a medicinal spring-tonic, happily sipped by the ladies without negative social stigma. Floral wines capture the essence of the summer season, capturing the memory of sunlight and warmth; perfect to sip beside the fire on a chilly night in the midst of winter. All country, or non-grape, wines, including floral wines, do not require lengthy aging and are to savor and enjoy within 18 months of bottling. Apple blossoms, apricot petals, violets, dandelions, rose petals, pansies, primrose, nasturtiums, marigold, red hibiscus flowers, honeysuckle, daisies, lilacs, lavender, buttercups, cornflower, clover, cowslip, chamomile, and calendula: the list of flowers that make a fine wine is seemingly endless. A flavorful, palette-pleasing wine can be crafted from any edible flower. Chose flowers with a pungent, delightful fragrance and no visible signs of damage or disease. Gather flowers from the garden when they are in full bloom and the most fragrant, snipping the best blooms when first opened in the morning, before the heat of the noonday sun. Pick the flower petals only, compost or disregard flower leaves and stems. It’s important to remove all greenery from stem or leaf, as it tends to make the wine bitter. Avoid using blooms sprayed with fungicides, herbicides, or pesticides. Although you can harvest wildflowers, glean flowers from the neighbor’s garden, or purchase flowers from a florist, I prefer to only use flowers from my garden, comfortable in the knowledge that they are cultivated organically, free from toxins and noxious chemicals. I also enjoy the satisfaction and pleasure of sipping “nectar” from the lovely flowers I nurtured in my homestead garden. To determine the taste of a flower, munch on a fresh bloom to savor its unique flavor. Flower petals can be frozen until you have collected enough for a fermenting a small vintage. I use plastic freezer-containers, labeled with the name of the flower, adding additional blooms as they open. Keep in mind that the smaller the flower, the more you will have to gather. Rinse flower petals and pat dry with a paper towel before freezing. Because it does take a lot of flowers to make a couple of gallons of wine, you can elect to mix types of floral blossoms or save each species individually until you have enough to blend up a batch of your favorite floral dry, semi-sweet, or dessert wine. For body, add organic white-grape-juice concentrate, orange juice, orange rinds, banana slices, or golden raisins. Many floral wines such as dandelion require an added acid such as lemon juice. Serve floral wines chilled, alone, or with lighter fare such as salads, fish, poultry, and pasta. Because flowers offer little in the way of natural sugars, floral wines must be sweetened with at least 28 ounces of sugar per gallon of liquid to accomplish the fermenting process and to provide the necessary sweetness to the finished vintage. Floral wines are also sweetened with honey, which is a lovely way to incorporate the honey from your homestead hives. Remember that no matter what type of country wine you are crafting—floral, fruit, herb or vegetable—always use fermentation containers made from stainless steel, ceramic, food-grade plastic, or glass. Avoid using cast iron or aluminum vessels, as they will react with the wine. Grandpa Pete learned how to make dandelion wine as a boy growing up in Finland, from a recipe passed down from his grandfather. This modern-day adaption is a basic recipe that can be used for crafting all types of floral country wine. To maintain an organic integrity in the vintage, select organic citrus, honey, and raisins. Experiment with substituting fresh cranberries for raisins or pink grapefruit in place of oranges. Fresh herbs or spices can be added to make a floral wine that’s uniquely yours. Gather dandelion blossoms in the early morning of a sunny day. When collecting, pinch off the flower head: avoiding any part of the stem. Spread flowers out on a mat of paper towels. Carefully remove all greenery as the bits of green plant material impair fermentation and destroy the delicate taste of the wine. Transfer flower petals to a wooden chopping board and mince. Place chopped flowers in a 5-gallon ceramic crock. The size of the crock allows for bubbling gases as the mixture ferments. Bring the water to a boil. I use spring water for its pure, sweet taste. Keep in mind, that your wine will only be as good as the water, so if your tap water is treated with fluoride or leaves something to be desired, use bottled water to not taint the taste of the wine. Pour the boiling water over the flower petals, cover with a layer of cheesecloth, place the crock in a warm place, and allow the mixture to rest for at least three days. Zest the peel of the citrus fruits, carefully avoiding adding any of the white pith to mix. Set aside. Remove the rest of the pith and discard. Next, chop citrus and raisins. Transfer the flower liquid from the crock to a large stock pot. Bring the liquid to a boil. Next, turn down the temp to simmer. Add chopped citrus, citrus zest, herbs, honey, spices, and raisins to the brew, stirring well. Simmer at a temp just below boiling for 45 minutes. Remove fruit and flower mixture from the heat. Strain the cooled liquid through layers of cheesecloth or a juicing bag to remove solids. Add sugar and yeast. Stir well until all sugars are dissolved and allow mixture too cool. Place the mixture in a ceramic crock and cover with cheesecloth. Use a wooden spoon or non-metal utensil to stir the mix daily. Fermentation typically takes place over two to three weeks. You will know it’s ready for bottling when bubbling stops. Slide a deflated balloon over each bottle top to check for additional fermentation. When the balloon remains deflated for 24 hours, fermentation has ceased: it’s time to cork your bottles. Store bottled wine in a dark, cool place and allow the wine to age for at least six months. The finished product will be a smooth, semi-sweet amber-colored liquid that tastes more like a fine brandy than wine. Because floral wines are generally made in the spring, the holiday season is a perfect time to share your country wine with friends and family. While most wine is made from grapes, that is not the whole story. Fine fruit wine can be crafted from any type of berry or fruit including pomegranate, cherry, plum, apricot, peach, pear, cranberry, mango, guava, watermelon, blackberries, huckleberries, pineapple, peaches, or strawberries: you name it. However, most fruits, other than grapes, fail to have the correct balance of sugars, yeast, and water to produce a stable, enjoyable wine. Country fruit wine recipes compensate by adjusting these ingredients at fermentation with the addition of honey, sugar, and spices to enhance palatability and alcohol content. High-acid fruits such as raspberries, strawberries, pineapple, and cherries are somewhat tart and sour, requiring additional sugar and water be added to offset the fruit’s acidity. As with any fruit preserving process, start by evaluating the quality of the fruit. Your wine will not be any tastier than the fruit used to prepare it. Pay careful attention to quality, avoiding bruised or stale fruit. Select fresh, firm, fully-ripe fruit to accentuate that particular fruit’s unique flavor and character. 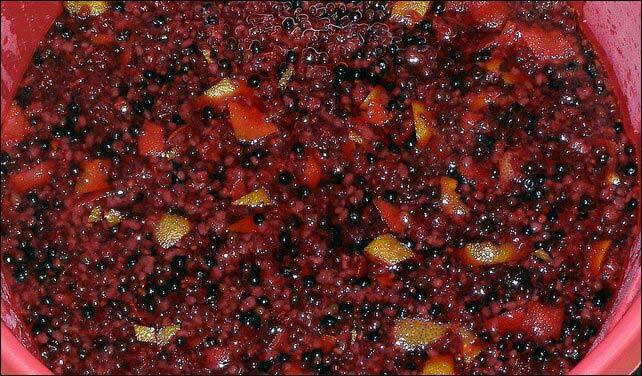 To prepare 5 gallons of wine will require approximately 20-pounds of pitted and peeled fruit. Country-wine crafters ask, what is the best type of sugar or sweetener to use? Feel free to experiment and try different sweeteners including honey, cane sugar, brown sugar, beet sugar, or powdered malt: it is all a matter of personal preference. Concentrated fresh fruit juices (or reconstructed from frozen concentrate) may also be used to boost sugar content, add body, and intensify flavor. Beets, parsnips, turnips, pumpkin, winter squash, and carrots all make a mighty fine wine. Get out your grandmother’s cookbook, visit the library, or look online for non-grape country wine recipes. You will find hundreds of recipes for country vegetable, herb, flower, and floral wines to utilize the bounty of the harvest. Sip and enjoy.